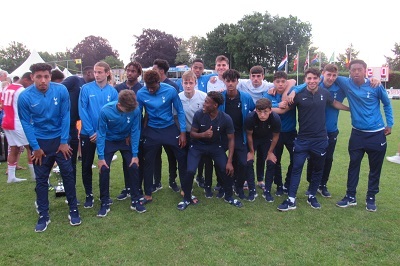 The squad for the tournament had experience and youth with some players who were also at the Volksbank Cup two weeks ago. Scott Parker was with John McDermott on the coaching staff. Spurs kicked of the first group game against the Danish side attacking the East end. It was an end to end game as both sides played long balls to try and get behind the back line of the other. The Danish side were better at it than Spurs who found the solid defenders tough to get past. Midtjylland had an early chance when Tengstedt got behind and lifted the ball over the advancing De Bie but wide of the goal. Griffiths played in Sterling for a chance that was wide. Tengstedt got down the left and pulled the ball back for Torp to stike a low drive inside the left post to take the lead. With a lot of big players Midtjylland were always dangerous at set pieces with De Bie saving a free kick by Torp for a corner. A short corner allowd Roles to put the ball into the area for Lyons-Foster to back-heel it at the near post only for the keeper to save. Tainio was booked as he fouled the dangerous Tengstedt to stop him getting away. A Shashoua corner was half cleared to Roles who hit his shot well wide. De Bie made a good save from Sebastian Jensen for a corner and when Christian Jensen got through the Spurs goalie was saved by the crossbar just before the break. Tracey replaced Roles for the second half as Spurs tried to get back on level terms. Griffiths played in Sterling to draw a save from the keeper before Maghoma replaced Shashoua in midfield with his first involvement being to take a free kick for a foul on Griffiths. His kick was over the bar and Spurs made their third change with Hinds being replaced by Parrott. Unfortunately Spurs' push was blunted when Duncan received a straight red for a foul on Olsen. He had stretched to reach the ball first but the Danish player was caught after he had played the ball which was hard on the midfielder who now misses the next game. Sebastian Jensen was booked for a foul on Marsh as Midtjylland saw out the game. In the other group match Atletico Paranaense came back from two down against SC Heerenveen to win 4-2 scoring three goals in under five minutes either side of half-time. Nascimento scored a hat-trick. P   W  D   L   F-A   Pts. In the other group SE Palmeiras top the table with a 5-0 win over De Graafschap as Ajax Cape Town drew 0-0 with Club Brugge. The last day of the group games saw Spurs play SC Heerenveen first needing a win to stay in contention for the semi-finals as Midtjylland drew with Atletico Paranaense 0-0. Spurs defended the West end in the first half which saw an early effort by Boasman go over the bar. Patterson fired wide when played in by Griffiths. Griffiths himself then fired wide when played in by Parrott. Ras was then wide before Griffiths drew the first save after Parrott had a chance blocked. Spurs replaced Thorpe with Tracey at half-time and his strong running made the difference as he won a free kick in the first minute which was taken by Patterson and hit wide of the far post by Parrott. A free kick for a foul on Griffiths by Drkusic was taken by Patterson and hit round the wall but saved by Wrzesniak. Following that corner Tracey was fouled in the area and a penalty awarded. Griffiths hit it down the middle but Wrzesniak saved with his feet as he went to his right. Shashoua replaced Patterson and was soon in the action playing a cross-field ball for Tracey to draw a save. Tracey provided the cross for Parrott to score, arriving at the far post. Beuker was booked for a foul on Tracey while Spurs replaced Maghoma with Roles. Roles played in Tracey to fire wide before he (Tracey) went into the ref's book for a foul on Beuker as their battle continued until the Dutchman was taken off. In the closing minutes Shashoua played in Griffiths but his effort was blocked. That win set up the last game of the day with Paranaense with a semi-final place at stake. Spurs needed to beat the Brazilians to overtake them and finish in second place. Midtjylland drew their last game to top the group. Spurs started again with a strong attacking side kicking off the first half attacking the East end in very hot conditions. Skipp got forward early on for a shot that was wide before Dos Santos played in Santana for a chance that was over the bar. Duncan played in Parrott for a shot that was wide before Atletico took the lead. A mistake on the left let in the pacey Brazilians and when De Bie got down to save, the loose ball fell to Nascimento to tap in. Skipp headed over from a free kick when Tracey was fouled. Tracey was not at right back for his defensive ability and in the second half Tainio came on for Maghoma allowing him (Tracey) to move forward. Tainio was not able to prevent an early shot over before Spurs won a penalty. Skipp on another of his forages forward was fouled by Simao which allowed Sterling to score from the spot hitting the left post to beat the keeper's dive. The game was finely poised as Leite drew a save and Parrott was wide from Sterling's ball but too many errors were giving the Brazilians chances. Romao was booked for a foul on Griffiths before Spurs conceded a penalty. Marsh was caught out on the right and in his attempt to recover he gave away the penalty by bringing Dos Reis down. Dos Santos made no mistake from the spot sending De Bie the wrong way. Spurs made a double change with Patterson replacing Tracey on the right and Roles going into midfield in place of Brown. Roles drew a save but the Brazilians ran the clock down as well as creating more chances. Leite fired wide before K. Dos Santos got the better of Lyons-Foster to beat De Bie with a rising drive in the last minute. That defeat meant that Spurs would have to play Club Brugge on day three in the 5th/6th placement game. On the last day Spurs only had one game. It was to decide who finished 5th out of Spurs and Belgian Club Brugge who finished third in their groups. Team(3-1-5-1):- De Bie(C); Tainio, Lyons-Foster, Hinds(Sterling 39); Skipp; Shashoua(Tracey 35), Duncan, Roles, Thorpe(Maghoma 35), Patterson; Parrott. As it was the last game, Spurs experimented with a new formation to use more players. We played three at the back using our only central defender with two full backs and Skipp in front to protect them. This gave five in midfield in support of a lone striker in Parrott who had been used in midfield up till now. Spurs defended the West end in the first half and took a little time to settle at the back which saw an early chance for Brugge when Voet had a header saved from a free kick. After Shashoua had a shot go wide, Lammens got down the right and whipped in a low cross that Kante just failed to convert. Lammens then had two chances. De Bie saved his first effort and when it came back to him Lammens struck the near post. Spurs were helped to settle when the Brugge keeper, Alferi gave the ball to Thorpe who tried to go round him but won a corner. Matondo was booked for use of the elbow on Thorpe after he had headed the ball. Hinds turned up in the middle to draw a save from a Shashoua pass. Alferi gave the ball away again, this time to Parrott who lifted the ball over the keeper and the bar. Declerck headed over before Shashoua played in Parrott for a chance that was saved. Early in the second half Parrott was played in by Patterson but his effort was blocked. Spurs made a double change with Tracey replacing Shashoua and Maghoma coming on for Thorpe who had just been clobbered by Matondo again. Maghoma quickly had a shot saved from Patterson's pass before Spurs made their third change. Sterling came on for Hinds and went into a back four with Skipp as Lyons-Foster moved to left back. Spurs' goal came from a ball out by Alferi. Maghoma was onto it quickly and advanced into the area before hitting it low into the far corner of the net. Lammens fired over as Brugge tried to get back into the game. Parrott was booked in a tussle with Cornette which saw the Belgian go to ground in an effort to pull the Spurs striker down. Spurs were able to see out the game and finished fifth, one place better than two years ago. 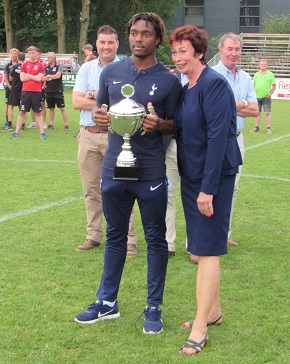 Kazaiah Sterling is pictured here with the cup awarded for finishing in fifth place.